It's October!! Can you believe it? I have so much going on this month, I know it's going to fly by! I hope you are enjoying my monthly challenges so far. I know I am. For October I have to go with a Halloween themed challenge. I love this time of year and all the little kids dressed up in costumes. 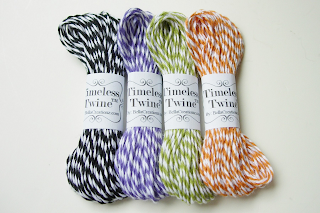 Now if you do not have twine, embroidery thread will work. This must be a new project and in your post you must mention my name and link if possible! 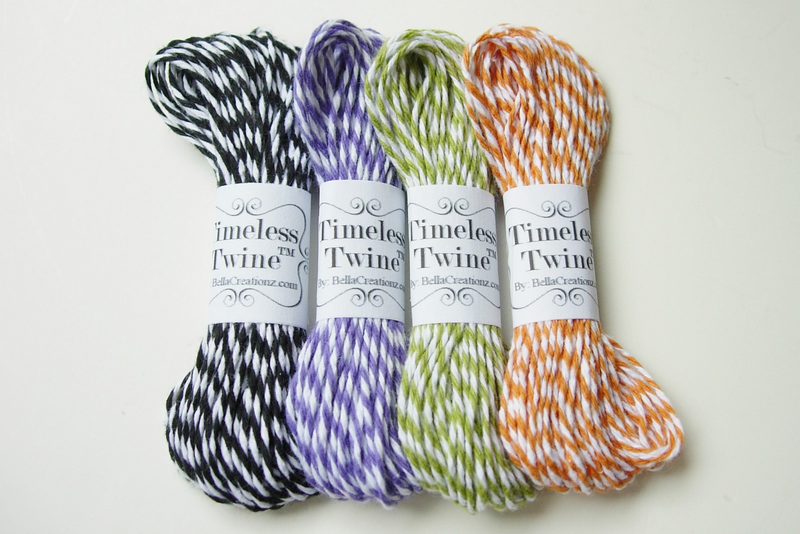 Our sponsor this month will be Timeless Twine. She will be giving our winner a Halloween Party Pack (40yds). You need to link your project up below using Mr. Linky and include a link to your post where you are displaying it. You have until midnight October 31st to link it up. Ready, Set, Go! And good luck friends!! Welcome everyone to our Halloween Blog Hop! If you came here from oh so crafty Mary Ellen then you are in the right place. If you just happen upon my blog, please start at the beginning at Creative Kuts to join in on the fun. Having a Bloody Good Time!! Isn't this to "die" for? Meet Norman. He's Creative Kuts' very own vampire. He's ready to party and have a good time! Oh what's this? Norman has a woman!! Looks like Norman better watch out. Last I checked she was Frankie's girl! LOL! And I think it is the best value ever. I mean title, peeker, and 3 figures all for $3.00 WOW! It's time to announce the winner of my blog candy but first I'd like to say Thank You to everyone who came by and hopped the Cupcake Wars Blog Hop with us! I hope you were deliciously inspired to create your own cupcake goodies!! Congrats Jodi! You have 2 weeks to contact me with your info so I can get these yummies sent out to you! And again thanks everyone for hopping with me! I will be another hop this Saturday, hope you will hop on by for some Halloween Fun! My layout is to "Die For!" Bwahhhh hahhhh hahh hah! Oh and don't forget just 3 more days to enter the September Challenge! You can find it here! Boy oh boy do we have plenty of sugar for you! If you didn't start at Janet's blog: http://janetscreativeworld.blogspot.com/ please go there now and start from the beginning. She's giving away a Cricut Lite Cartridge-Cupcake! How sweet is that? We don't want you to miss any of the scrumptious projects and some have even left recipes for you to try! As we head into the holiday season, you might just have a new family favorite! This is a one day hop. You should have come from the lovely and talented Jessica. I have been wanting to create my own cupcake mini album for a while now so this blog hop was just the motivation I needed!! I used the Simply Sweet Cricut Cartridge to cut my cupcakes out of chipboard. And lastly my back cover! And now for my recipe!! I don't make cupcakes from scratch ever so this recipe is easy and super fun to do. 1. Heat oven to 350°F. Place jumbo paper baking cup in each of 12 jumbo muffin cups. 2. In large bowl, beat cake mixes, water, oil and egg whites with electric mixer on low speed 1 minute, then on medium speed 2 to 3 minutes, scraping bowl occasionally, until well blended. 3. Divide batter among 6 separate bowls; tint each bowl a different color. For red, add 18 drops red food color. Orange: 4 drops red and 12 drops yellow. Yellow: 12 drops yellow. Green: 12 drops green. Blue: 12 drops blue. Purple: 9 drops red and 6 drops blue. 4. In each muffin cup, place 1 tablespoon red batter. Add about 1 tablespoon of each remaining color batter until you have added all 6 colors. 5. Bake 30 to 40 minutes or until toothpick inserted in center comes out clean. Cool 10 minutes; remove from pans to cooling racks. Cool completely, about 30 minutes. 6. Pipe or spread frosting on cupcakes. When you bite into these the colors are just so cool! I will be giving away some blog candy of my own!! YAY! It's a surprise Grab Bag of fun embellishments and eye candy!!! So if you want to win leave a comment here and become my follower. I will draw one winner from all comments left. Oh and be sure you leave your info so I can contact you. Good luck! You'll have today and Sunday to leave your comment and be entered! UP NEXT is the lovely Erica!! Hello again crafty friends from Connie at Connie Can Crop! School is in full swing now, so what better time to bring you this really fun school layout for your back to school photos. This layout required 2 Creative Kuts files: KnOWLedge Owl﻿ and The Professor. KnOWLdege Owl can be purchased for the low price of $5 and The Professor is only $3. What a deal! Can you believe my oldest is in High School this year? I sure can't! So when planning this layout I had the idea of making a more mature school layout for either my son's high school pics or maybe even my College pics. I won't know which one until I pull those pictures and decide which looks best. Who doesn't love Cosmo Cricket?? I thought this line of Blackboard items was just perfect for a Back to School Prize! The Original Blackboard "Happy's Album"
Blackboard "Jack's World" 73 piece Die Cut set. In case you are wondering... Black board is like chipboard only better because it is black !! Be sure to enter my Challenge and become a follower! Hey Blogging friends...I have two very good friends who are just getting started in the blogging world. Won't you help us out by checking them out and following them? Please! You know how much we love to inspire each other!! Seems like forever ago when we had Disney passes. And I can honestly say we sure do miss them. As soon as our financial situation turns around my boys and I will be back! I promised Mickey that! With all my DT projects and ebay stuff lately﻿ I have fallen very behind in my personal scrapping, so it felt really good to finally get these layouts made from 2009. Just a bunch of random holiday shots of my kids, mom, and nephew! That little Mickey and Pluto took longer than the whole layout but it was so worth it!! Now this layout is us with Santa at Disneyland. He is the cutest Santa ever!! Of course I had to use my favorite Christmas cartridge Jolly Holidays to make my little Santa diecut. And guess what....he wobbles! I figured I love using action wobbles on my cards, why not use one on my layout and make Santa really Jolly!!! LOL! I love him!! I am entering the Blue and White layout in the Die Cuttin Divas Challenge #82. We had to use our school colors and since I am now the mom of a high school kid I went with SUMMIT HIGH SCHOOL all the way!! Oh and Hey while you are here why not take a look at my new monthly challenge tab. September's Challenge is in full swing!! I have some cool goodies to give away!! I have several friends who are teachers and some of them are ready for the next break! LOL! With them in mind I thought sending them this little pick me up might just make their day AND it gave me a reason to finally use my Wild Card 2 cartridge! YAY! Can I just say this cartridge has so many cute cards! And it makes it really easy to create your own! Inside stamp sentiment is from American Crafts. And outside I peachified my apple with a Peachy Keen Face stamp but only inked the nose and mouth since the eyes would not show. I love Peachy Keen stamps! Oh and for some added flair I added two very small button brads, one to each end of the glasses. Oh and Hey while you are here why not take a look at my new monthly challenge tab.September's Challenge is in full swing!! I have some cool goodies to give away!! This week's Bap is a Pull Tag Card. 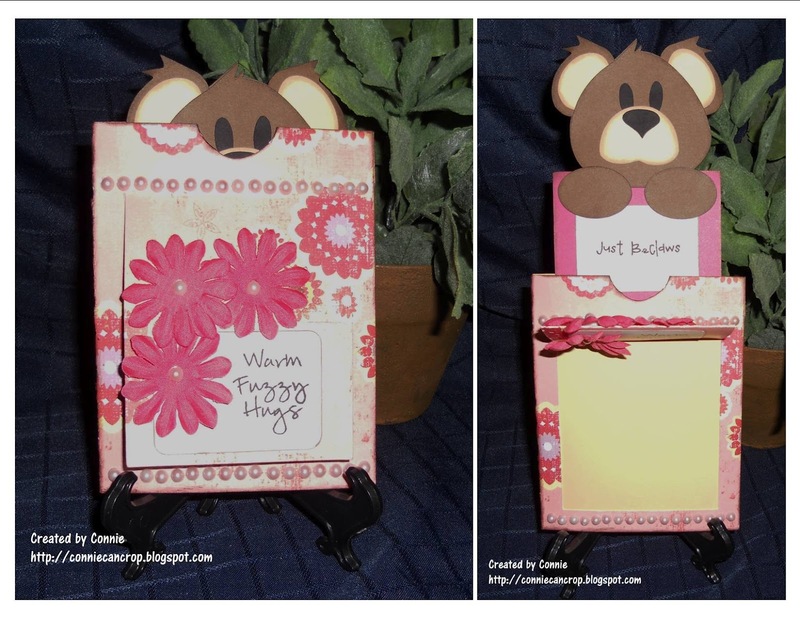 I decided to make my tag a teddy bear and use some fun stamps from Pink by Design. This file is really cool because when you pull up the Teddy Bear the flap lifts up allowing you to see not only the Teddy Bear's saying "Just beclaws" but an area below for your own personal note. What a fun creative way to make someone's day!! I am entering this project in the Creative Cutting Challenge. Thanks so much to the gals who played along with my challenge for August! You all created some wonderful cards and layouts! But as you know there can only be one winner!! Kathy you get to grab my winner button for your blog plus you win my fun prize from StorytellersClub!! Congrats! Be sure to email me with your address and info please so I can get your prize out to you! Last Call for August Challenge Players! The new Fall Winter 2012 Catalog is here!! There are so many awesome things in this catalog! and help support us Stay at Home mommies!! Thank you! Only 3 more days to enter!! So far I have 2 great entries but there is room for many more!! And your chances of winning are great! If you haven't popped over to checdk out this new blog being run by dear friend Ashley and new friend Lisa..you are missing out! These gals are amazing and this blog is the bomb! 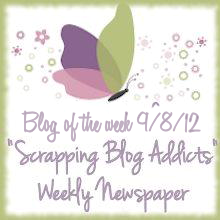 Come join Scrapping Blog Addicts Pre Blog Hops group. If you like blog hops this is the group to join. atures current challenges, design team calls, information on all the different stamp companies, digital stamp companies, paper piecing companies. It also features sales that are going on in the crafty world. We do this blog to help fellow crafters and to give them a place where they can find information to do what they love to do. 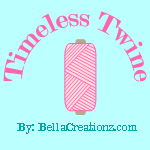 We created this blog out of the LOVE for crafting. If you are interested in checking the blog out you can do so by going here. 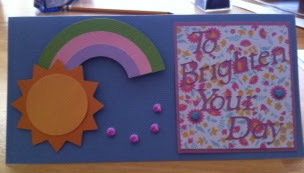 This file is available in the store for only $2.00 and I see some adorable cards being made with it too. Or how about a Halloween Party invite? LOL! That would be so fun!! I decided I had to create a layout with because every year when I pass out the candy to the neighborhood kids I like to dress up too. Sometimes I am a pirate, a ghost, or even a gypsy but this year I am going to dress up like a witch!! Can't you see my witchy poo face on this layout right now. Better start working on my cackle! So excited to be entering this layout in the CARDS TV Challenge #14 Holidays. American Football starts both collegiate and professional seasons in the beginning of September. Now I myself am not a huge Football fan but now that my kid plays in the marching band I will be attending many football games! Go SKYHAWKS! LOL! So let's all show our Team Spirit!! Create a project of any kind (card, layout, altered item) and include a banner or flag. You may use any products you like. Your banner can be a diecut, a stamp, hand drawn, an embellishment...whatever as long as I can see it!! You have until midnight September 30th to link it up. Want an extra bonus?? Share my new challenges with your followers by posting the info above on your blog. Then come back and post here that you shared it and I will enter you in to a seperate drawing for a bag of goodies!! Help me by spreading the word! Thank you so much for all your support!! Are you ready? Let's show some team spirit! !